There’s construction underway at the corner of Howard Street and Hawthorne Lane in SoMa, and sometime during the last few months the building that previously stood on the corner was demolished and removed. 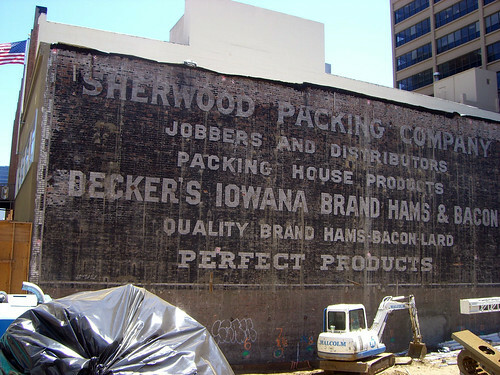 The result is that this fantastic “ghost sign” for the Sherwood Packing Company, a long-forgotten wholesaler of pork products, has re-emerged to see the light of day. The sign is painted on the side of 639 Howard, and in a fittingly postmodern coda, the building that once housed the Sherwood Packing Company is now home to… A Verizon mobile phone shop.